Can more be said on the subject of compost? Apparently yes, more can be said on this subject. 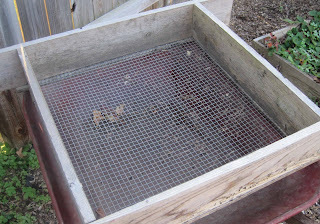 Someone requested that I show you all what my homemade compost sieve looks like. Generally, I throw two or at most three good sized shovelfuls of compost onto the screen part and then push it through into the wheelbarrow with my hands. It is best to wear heavy leather gloves for this work; lesser gloves will end up with holes in them in no time at all. I know this from first hand experience. What doesn’t make it through the sieve goes back into the compost bins for further breakdown. My bins didn’t start out as nice as they ended up last Sunday. They were actually fuller than that, but I had already removed some of the uncomposted “stuff” from two of the bins before I remembered to take a “before” picture. Here’s the after picture, one more time. What you don’t see in this picture is the bamboo screen that I usually use to hide the bins during the growing season. 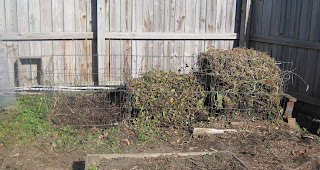 I purchased the screen and the wire compost bins from the Gardener’s Supply Company. The bins have lasted for at least 10 years and show no signs of needing to be replaced, and I’m on the second screen in that same amount of time. To keep the screen from being completely destroyed in the winter time, I store it under a tarp with all kinds of other stuff to keep the ice, rain, and snow off of it. After reading my post on “Embrace Compost”, Dee from Red Dirt Ramblings suggested in a comment that everyone post about their compost bins, sort of a “I showed you mine, now you show me yours” contest, except there is no real prize other than I promise you’ll be richly rewarded with wonderful compost if you do have compost bins. So how about it, what does your compost set up look like? Post about it and let us all see. Leave a comment here with a link so we can find you! And if you are disappointed that there is no prize for posting about your compost bins, don’t forget you still have time to enter the contest to win a copy of What’s Wrong With My Plant? (And How Do I Fix It?). How’s that for a great prize? And there will be three winners! It’s easy to enter. Just go to that post, enter your name and a url in the Mr. Linky Widget and leave a comment there telling us about a problem one of your plants has. Deadline to enter is November 16, 2009, 5:00 PM EST. You have such a nice neat compost system. That seive looks great too. I guess wire bins really are one of the best ways for compost, as they get the most air this way. Perhaps you need to be a bit more frequent with the watering to keep moist though? Like the idea of the bamboo screen too. Would like to see it in action. Pictures perhaps? Post on Twitter? Nice sieve, kind of like my brain at times. I will add this to my project list! Fabulous idea! My compost is an atrocious mess. No bragging. My composting system is not as organized as yours, but one thing that can be said about composting is that it eventually works, no matter how unorganized it is. I just visited the New York Botanical Garden where they have big compost piles, but I didn't get to see them alas. I, too, love compost. Sometimes I think it's the main reason I garden. There is nothing like the rich, earthy smell of sifted compost and the lovely texture as I scratch it in to our heavy clay or top dress the overwintering annuals such as larkspur and bluebonnets. I have a compost tumbler and a open pile next to it. I have recently bought a new chipper/grinder which I've yet to review. I've had various types of bins over the years but I'm not currently doing much composting because I really don't have room. Much as I would love a tumbler, I have no idea where I would put it! I don't have anything nearly that elaborate but it is so smart to do it this way. 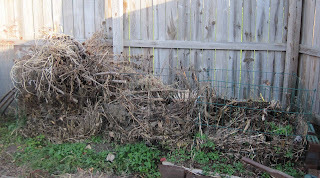 You'll not stand the chance of getting something that will burn your plants cause it's not done composting. It does reap huge rewards doesn't it? I compost everything but since I'm single it is a wacky off-kilter bunch of stuff. So many coffee grounds my Clematis have the jitters! You have such valuable ideas and insights! Thank you for sharing your ideas!